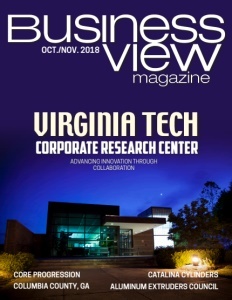 Business View Magazine interviews Steven A. Gould Jr., Airport Manager at the Rock Hill-York County Airport as part of our series on regional American airports. 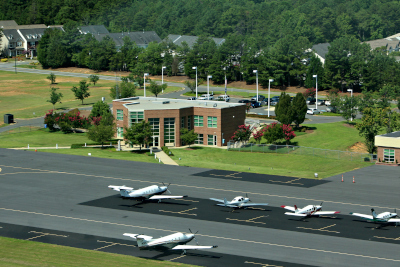 In 1956, an Airport Commission was established to develop an airport to serve the Rock Hill area. The Airport Commission located a 364-acre tract at the Old York and Celanese Roads intersection and the Rock Hill City Council approved property purchase and acre-for-acre exchanges to obtain the necessary land. In 1958, Rock Hill City Council applied for a federal grant to construct the Airport from the Civil Aeronautics Administration (CAA), the predecessor agency to the FAA. The CAA offered the City a $126,000 grant to perform site preparation, paving of air operations areas, runway/taxiway lighting, and landscaping. So, right from the start, there was a thought that the airport would be an important factor in community development. 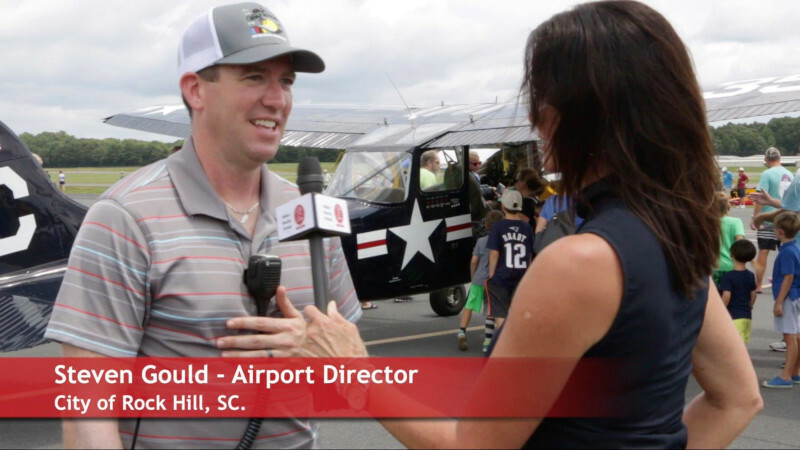 Gould continues to work for this vision and, these many years later, Rock Hill-York County Airport bills itself as a real alternative to the much larger and busier Charlotte Airport, with facilities that offer quick, streamlined arrival and departure capabilities for general aviation. Add to that a 7,200 square-foot terminal building designed for the business user with a large conference room available for use and a large concourse area downstairs that includes a pilot lounge, pilot shop, and flight planning facilities, and you have something to meet every need possible. 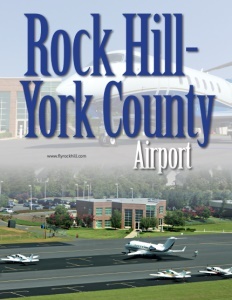 Rock Hill-York County Airport is owned and operated by the City of Rock Hill. A joint City/County Airport Commission advises the City Council on operational matters and advises both the City and County Councils on planning and capital improvements. There is sort of a Field of Dreams “If you build it they will come” reality to this work, but it is also a nod to the increase of traffic and the increased size of airplanes. The municipality has been negotiating with the Federal Department of Transportation since the late 90’s to get a runway extension and bring it up to 6,500 feet. “We are not self-sufficient,” Gould adds, honestly. “That is the number one goal of all airports, especially general aviation. That is also probably the hardest place for general aviation airports to get to. So, right now, my operating budget is about $400,000 annually, and my direct revenues, which include things like ground use rental costs, fuel flowage fees, and different concessionaire fees go directly back into the budget to try and offset costs; and that usually accounts for about 50-65 percent of the costs. The remaining comes out of the general fund. And then, when it comes to capital projects, we receive about 90 percent from the FAA whenever they are approved projects, then 5 percent from the South Carolina Aeronautics Commission, and then the other 5 percent is actually split 50/50 between the city and the county. That is one of the things we are very fortunate compared to other airports in the state, which are typically county-run and they are on the hook for the whole 5 percent. But, we split it up 50/50. There is also a flight school on site, Fly Carolina. Their business has been growing and they do also offer some maintenance on the field. Another group using the Rock Hill-York County Airport is the local chapter of the EAA (Experimental Aircraft Association), which has various events throughout the year including multiple Young Eagles rallies. This is a program that allows children between the ages of 8 and 17 to have free introductory flights to try and get them interested and engaged in aviation. Skytech is a General Aviation sales, service, management, & charter organization representing the Piper and Pilatus PC12 and PC24 product lines, as well as quality pre-owned aircraft. With full-service FBO’s in Westminster, Maryland and Rock Hill, South Carolina, Skytech is ideally positioned to serve the Mid-Atlantic aviation community.